You'll be £4.99 closer to your next £10.00 credit when you purchase Fight for the Sea. What's this? This collection of popular naval stories covers the entire span of World War II, beginning when the British Royal Navy faced fascist forces on its own until the final Allied victory over the Japanese in 1945. 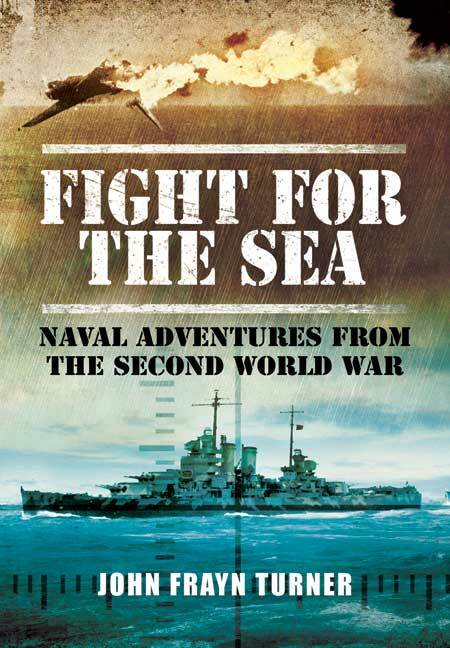 Fight for the Sea offers a rich mixture of accounts about such large and well-known battles and operations as the Battle of the Coral Sea, as well as lesser-known actions such as the submarine attack on Corfu harbour, the loss of the USS Leedsdown, and the saga of the USS Rich to characterize the breadth and variety of the war at sea. Also included are memories of John F Kennedy's heroic actions with PT 109 and George H W Bush's near-death experience with an aircraft known as the 'flying casket'. A sailor's eye view of the war at sea, this compelling compilation has broad appeal. John Frayn Turner's prose crackles with action and tension to keep the reader's attention, and even those who know little about the war will find the stories to be a welcome introduction to the subject. Among the book's special attractions are the little-known contributions of rescue ships and merchant seamen and the adventures of civilians, including Johnnie Ferguson, who spent three weeks adrift in an open boat when her ship was torpedoed. Readers will come away with not only a clear understanding of the giant scope of World War II but of the individual grit and determination that produced victory. Covers a very wide range of topics ... All of the chapters are well written, with many supported by a good use of eyewitness accounts. This collection of popular naval stories covers the entire span of World War II, beginning when the British Royal Navy faced fascist forces on its own until the final Allied victory over the Japanese in 1945. Fight for the Sea offers a rich mixture of accounts about such large and well-known battles and operations as the Battle of the Coral Sea, as well as lesser-known actions such as the submarine attack on Corfu harbor, the loss of the USS Leedsdown, and the saga of the USS Rich to characterize the breadth and variety of the war at sea. Also included are memories of John F Kennedy's heroic actions with PT 109 and George H W Bush's near-death experience with an aircraft known as the 'flying casket'.A sailor's eye view of the war at sea, this compelling compilation has broad appeal. John Frayn Turner's prose crackles with action and tension to keep the reader's attention, and even those who know little about the war will find the stories to be a welcome introduction to the subject. Among the book's special attractions are the little-known contributions of rescue ships and merchant seamen and the adventures of civilians, including Johnnie Ferguson, who spent three weeks adrift in an open boat when her ship was torpedoed. Readers will come away with not only a clear understanding of the giant scope of World War II but of the individual grit and determination that produced victory. He is the only living biographer of living fighter pilot Douglas Bader, with whom he worked closely on two previous books. John has written twenty-seven books and is an authority on aviation. He is the only living biographer of legendary fighter pilot Douglas Bader, with whom he worked closely on two previous books. This superb collection of gripping naval stories covers all the theatres and the entire span if the Second World War. Offering a rich mixture of accounts, it includes well-known battles and operations as well as lesser-known, but equally important, actions. This compelling compilation has broad appeal and John Frayn Turner's prose crackles with tension. Among the books special attractions are the little-known contributions of rescue ships, merchant seamen and civilians. Fight for the Sea gives readers a clear understanding of both the scope of the conflict and individual sailor's grit and determination that ultimately produced victory. John was the highly respected author of thirty non-fiction books – mainly militaria and biography associated with World War 2. We are proud to have sixteen of his fine works in print including all the titles mentioned below. Although born in Portsmouth with a Naval family background, he became closely connected with aviation and the Royal Air Force. During the Second World War, John worked at HMS Vernon on magnetic and acoustic mine trials before being conscripted from 1946 to 1948. Shunning a career in accountancy, he went into publishing culminating as editor of House Beautiful magazine. In the 1960’s John joined the Air Ministry and was responsible for RAF publicity and recruiting literature. He made numerous test flights, flew at twice the speed of sound and accompanied the Red Arrows. He later became managing editor of five London-based arts magazines. He wrote countless theatre and film reviews. In 1968, already a well-respected author, John met the legendary Douglas Bader. The two men worked closely on Fight For The Sky and The Bader Wing. Bader wrote the Introduction to John’s classic British Aircraft of World War 2. Our list also includes acclaimed epics like Invasion ’44, arguably the first full account of D-Day, Fight for the Sea, The Battle of Britain and the definitive VCs of the Second World War and The Awards of the George Cross. He also wrote The Life and Selected Works of Rupert Brooke.